How beautiful did that last dish of Alice’s look?? 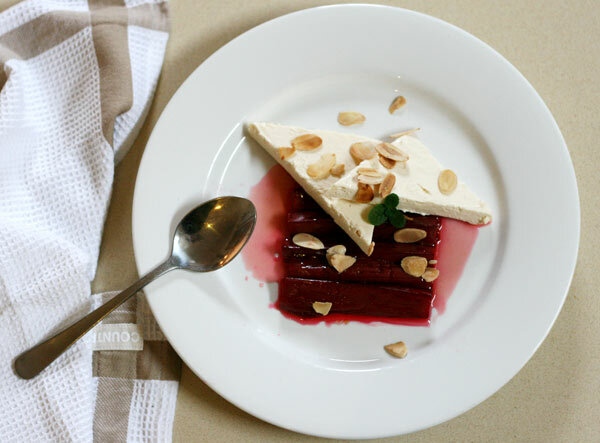 The colors and flavors of the rhubarb and the semifreddo seemed like the perfect combination. 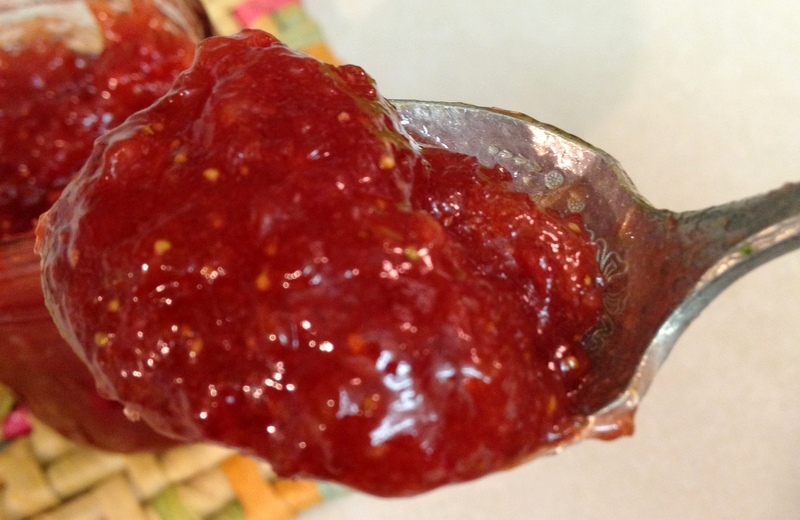 I haven’t cooked much with rhubarb, but I have been holding on to a jar of strawberry-rhubarb jam that my friend Rachel gave me. 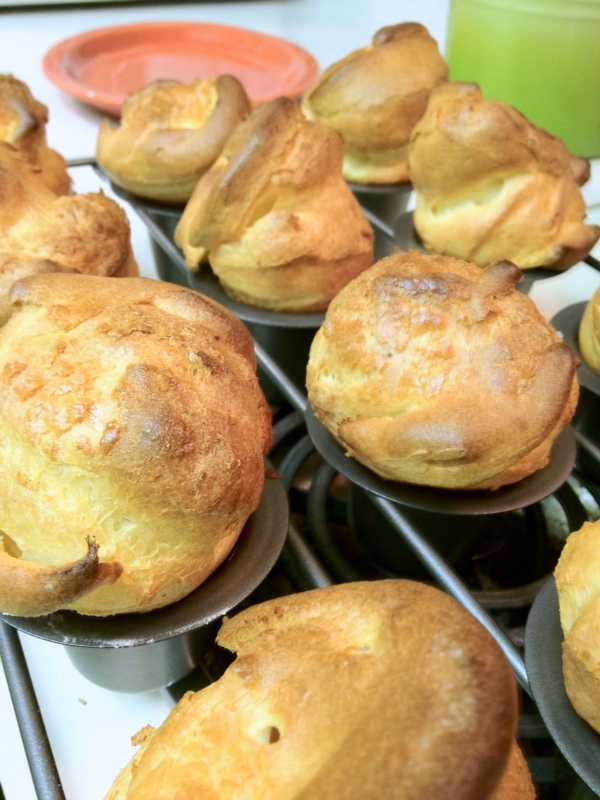 And what better time to break it out than right now, to generously dollop on freshly baked crusty popovers! Popovers are muffin/pastry-type things with a large crusty exterior and a hollow eggy interior. They are delicious right out of the oven, smeared with butter, jam, Nutella or even eaten with a slice of cheese. 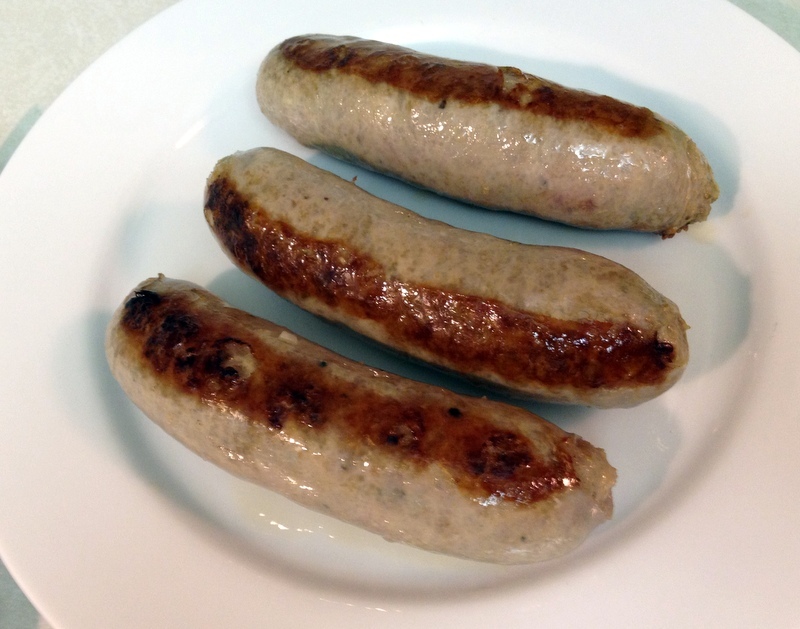 At our house, I was always asked to make them for breakfast, but they are also a wonderful accompaniment to a nice pot roast or roast beef dinner. It’s an easy recipe and the secret is using a proper popover pan. 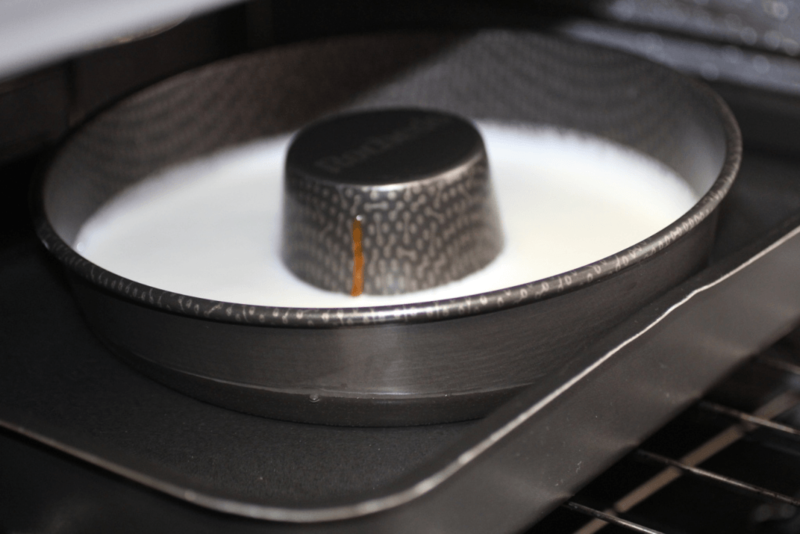 NordicWare has a great non-stick pan and Chicago Metallic has a less expensive pan that is equally as good. If you use the proper pan, your popovers should pop every single time. 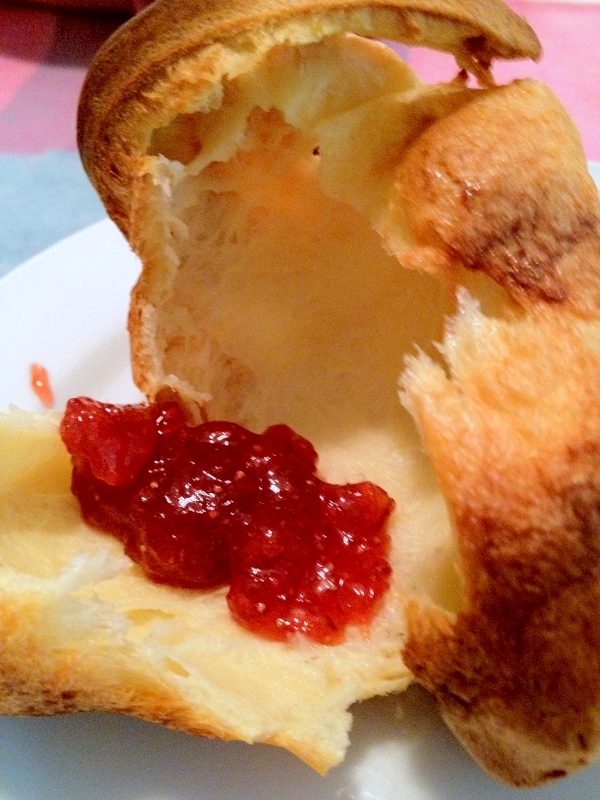 If you don’t have a popover pan and still want to try this recipe, please do! You can use a muffin tin and spray the cups with a cooking spray before adding the batter. You can also butter or spray some custard dishes rather than using a muffin tin. After they have finished baking, just run a table knife around the edges of the pan or custard dishes before removing the popovers. Add the flour all at once, mixing until incorporated and smooth. Then mix in the melted butter all at once. Preheat the oven to 450° F/230° C. While the oven is pre-heating, fill each of the cups in the popover pan about two-thirds full. Set the timer for 20 minutes after which, without opening the oven door, turn the heat down to 350°F/175°C and set the timer for another 10 minutes. If you like a crustier, more well done popover, then let it go for another 5-10 minutes after that for a total of 35-40 minutes. If you are going to eat them right away, just tip them right out of the pan. If you are going to wait to eat them, pierce each one with a sharp knife to let some of the steam out. Then smear it with the good stuff. Alice? Where are these crusty delights sending your imagination? Preheat the oven to 450°F/230°C. 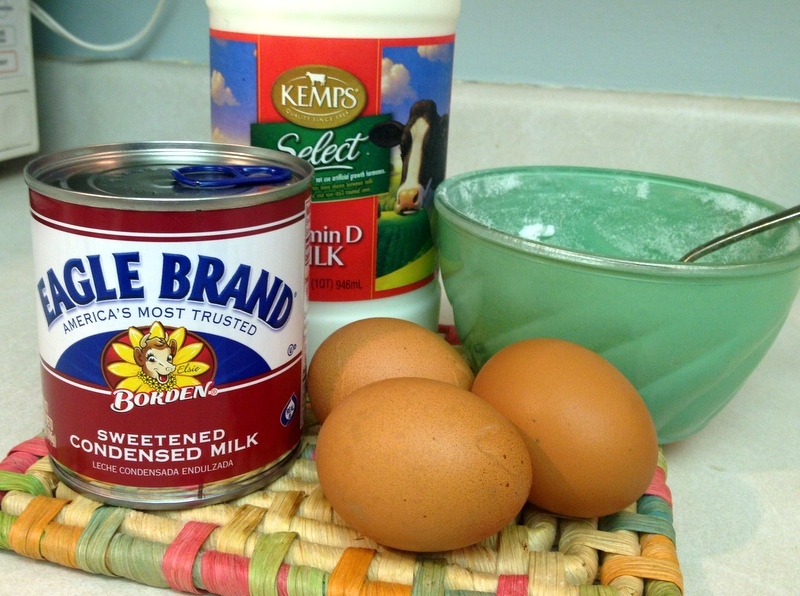 Use a wire whisk to beat together the eggs, milk and salt. 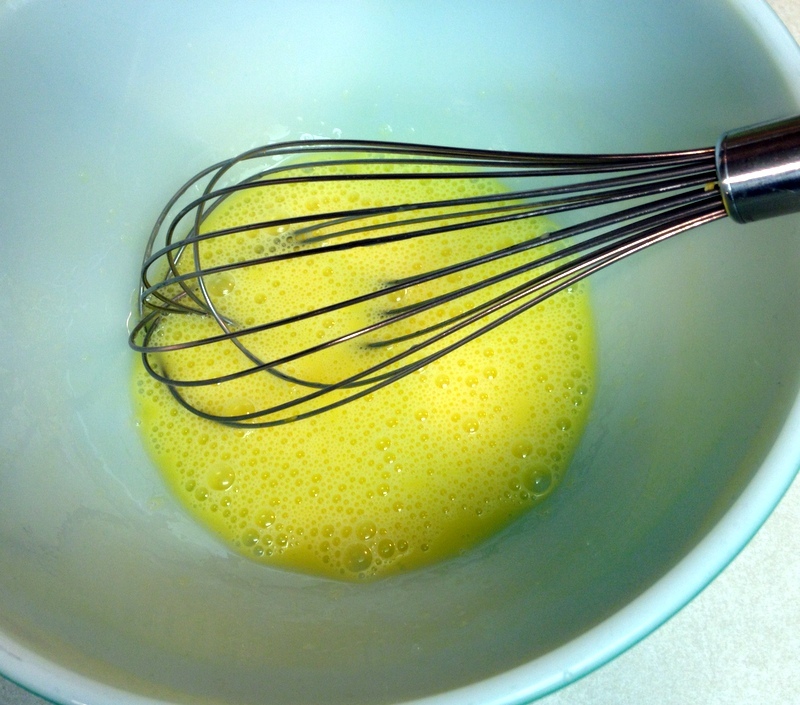 Whisk till the egg and milk are well combined. 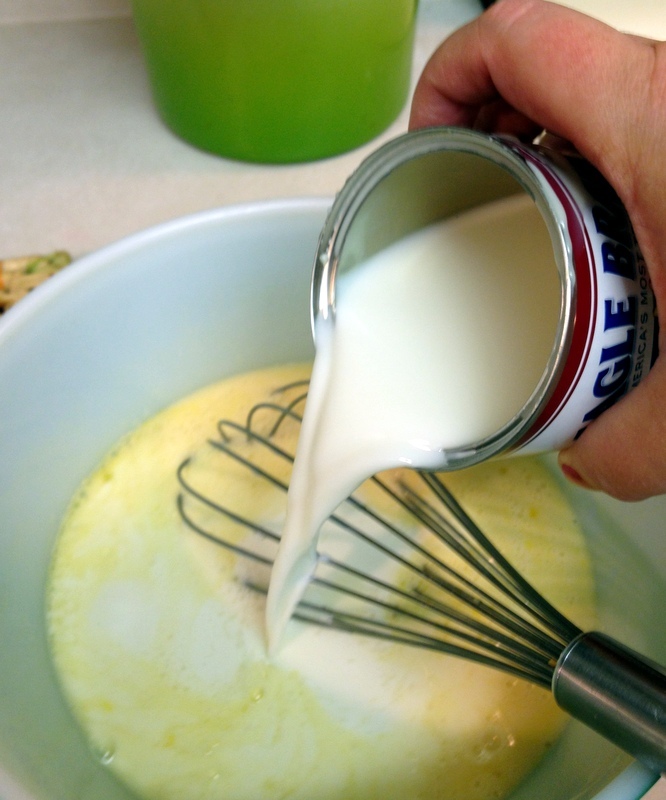 Add the flour all at once and beat with a wire whisk till frothy and smooth. Add the melted butter, combining quickly. 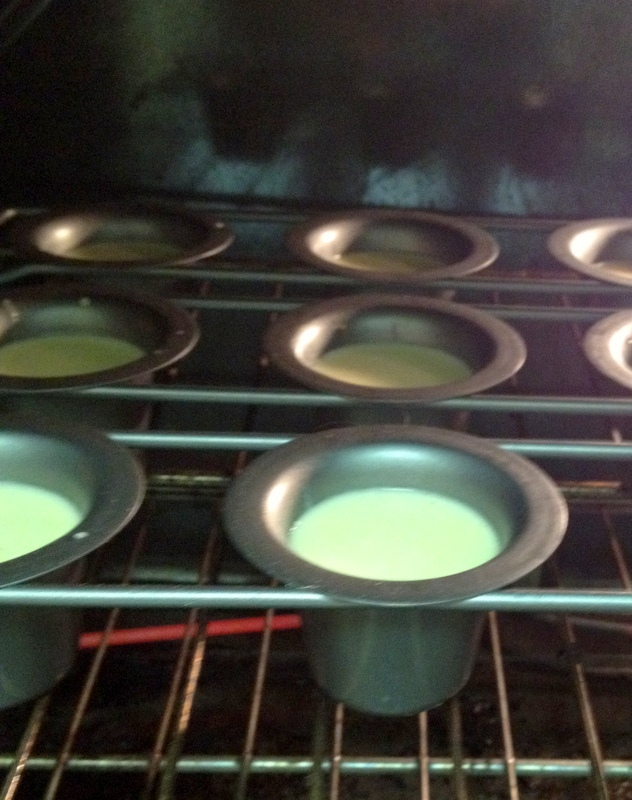 Pour the batter into the popover pan cups, filling them about 2/3 full. When oven is up to temperature, place pan into the middle rack of the oven. 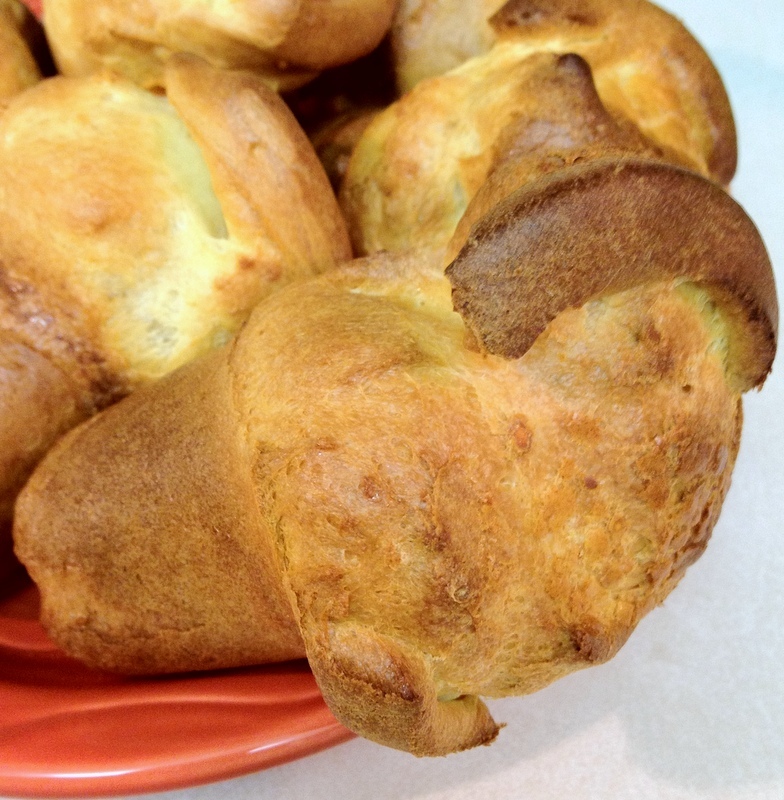 Bake the popovers for 20 minutes without opening the oven door. Reduce the heat to 350°F/175°C (again without opening the door) and bake for an additional 10 to 15 minutes, until they’re a deep, golden brown. 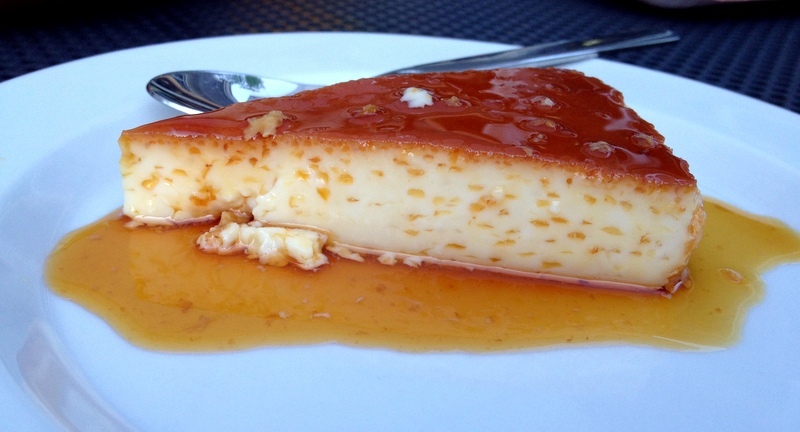 How perfect did Brenda’s Brazilian version of crème caramel look? One of our readers asked for ice cream recipes PLUS I am looking after a house with very healthy rhubarb plants PLUS I discovered Spanish Moscato, a rich raisiny fortified sherry. That is how this dish came together. The thing with making ice cream, is having a good enough churn. But a semifreddo is unchurned, and in fact, this one is uncooked also. It is in the peasy realm of easy. This is simply some rhubarb roasted in the oven, alongside a semifreddo, made with whipped cream and Mascarpone cheese, flavoured with some of the sherry. In fact, you could try other liqueurs if the Moscato sherry isn’t sitting on your bench. Semifreddo has a slightly firmer texture to ice cream. I was experimenting with the recipe as I went, so I haven’t taken ‘how to’ photos this time. It is such a simple recipe, you’ll be fine! Whip the cream with the icing sugar until soft peaks form, then fold through the Mascarpone and sherry. Line a tray, that will fit in your freezer, with baking paper (I used a slice baking tray). Spread the cream mixture in to an even layer on the paper. Cover with cling film and leave to freeze, overnight if possible, but 6 hours would be fine if it is thin like mine. 500g (1 pound) rhubarb, leaves discarded. Preheat the oven to 180/350. Rinse the rhubarb, and cut in to identical length pieces. Place the rhubarb in to a baking tray, and sprinkle with the sugar and toss around a little to coat. Drizzle the water over and cover with foil. Bake for 15 minutes, and then pull out of the oven and remove the foil. Carefully turn the pieces of rhubarb in the pan, so as not to break them. Spoon over the sugar and water which will have now started to dissolve. Put back in to the oven for another five minutes uncovered. It will be ready when it is tender to the prod of a knife, yet is still maintaining its shape. Toast up some almond slivers in a dry pan over medium heat, being careful to move them around as they cook so they don’t burn. The time will depend on your pan and how hot it gets, but around five minutes. Take them off the heat when they are lightly golden. Place the rhubarb on the plates, with a little of the syrupy juice. 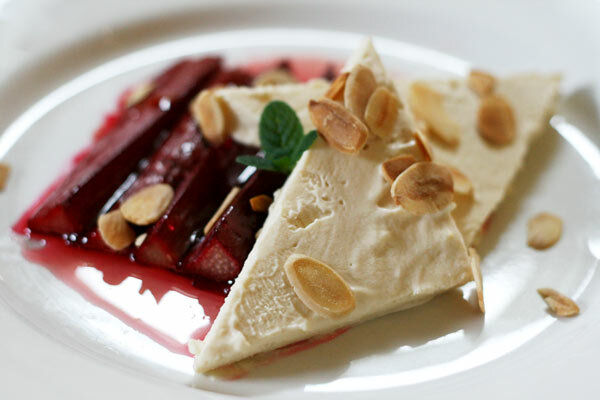 Cut the semifreddo in to triangular pieces with a hot chef’s knife, and place on the plate beside the rhubarb. Heat the knife by dunking it in a jug of hot water, and then quickly drying it with a tea towel. Garnish with some of the freshly toasted almond slivers, and maybe a tiny sprig of mint. There you go Kandis, an ‘ice cream’ recipe for you. 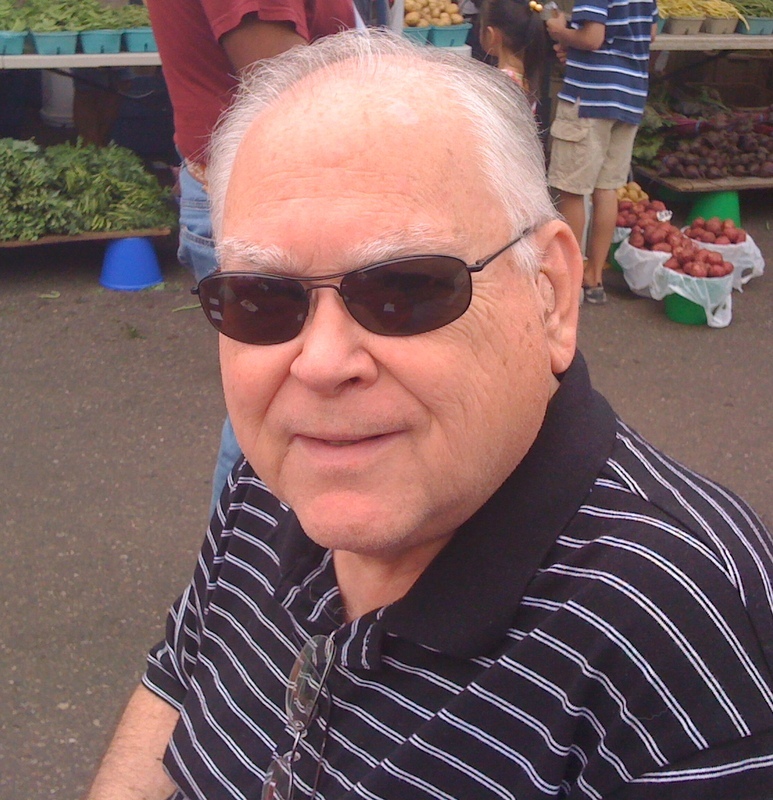 Over to you B… Don’t suppose it is rhubarb season in Minnesota?! We’ve worked our way through an entire meal with the addition of the delicious rabbit dish that Alice shared here, so now who is interested in dessert? 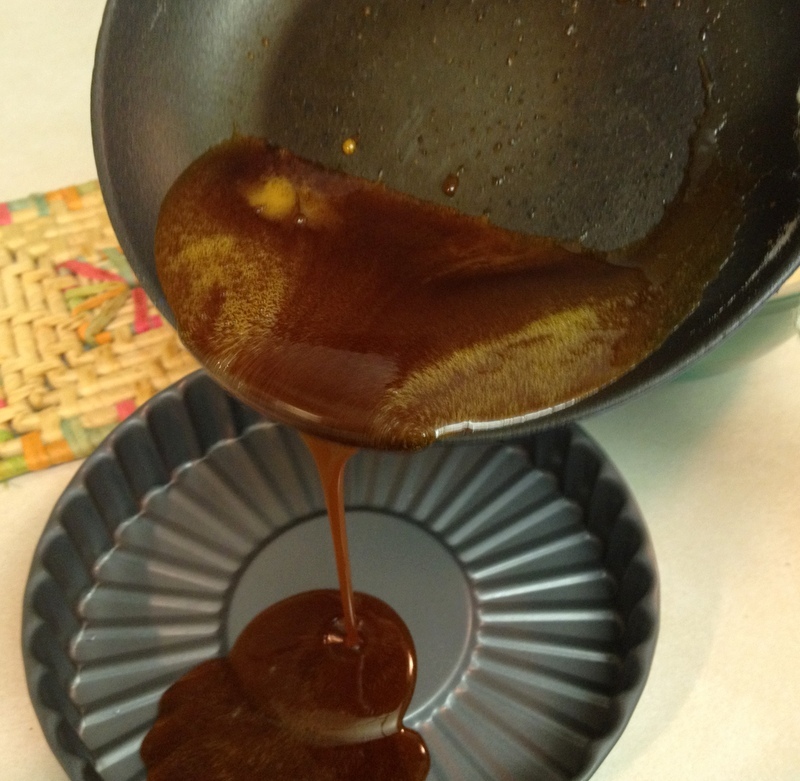 Let that sit for a few minutes while you make the caramel sauce. 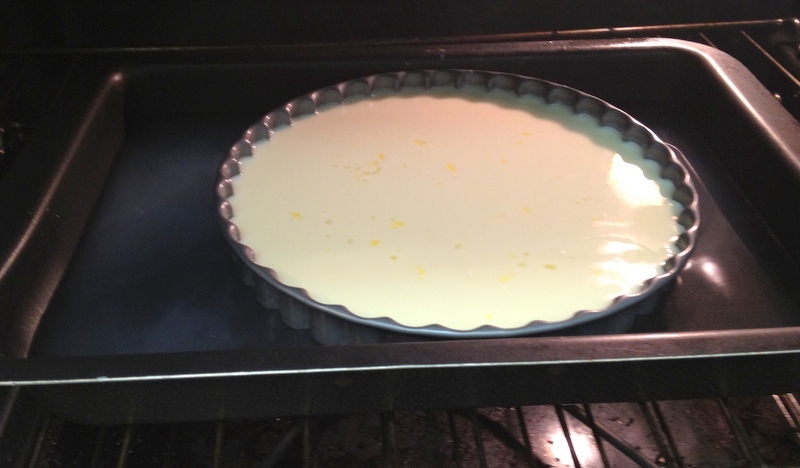 Letting it rest for a while will allow the bubbles in the custard mix to settle down a little before baking. Put filled pan into a water bath – which is as simple as a baking sheet with about an inch of hot water in it. Let it cool for about 30 minutes, then turn it out onto a deep dish serving plate. The sauce is very runny and sticky, so be sure it doesn’t spill all over your counter by using a serving dish that is deep enough to catch it all. Well, Alice, we’ve had our little bite of sweetness. What’s next?? 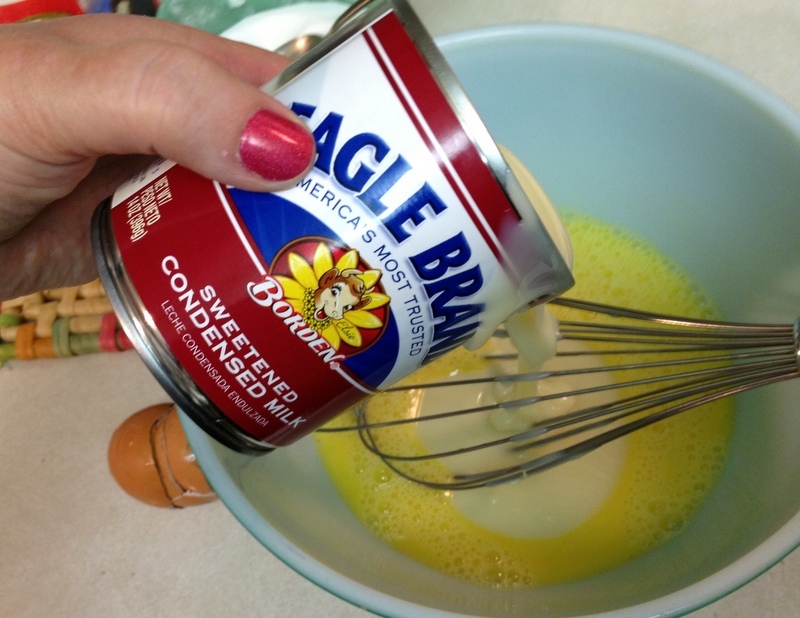 Whisk the eggs in a medium sized bowl until smooth, then add the sweetened condensed milk and mix together. 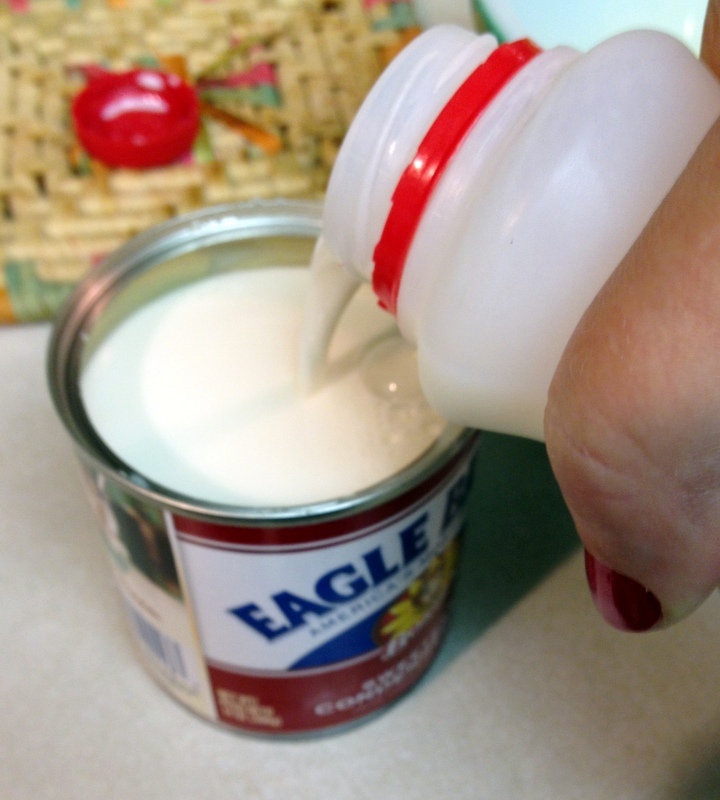 Use the empty condensed milk can to measure two cans of milk into the mixture and combine well. Set aside. 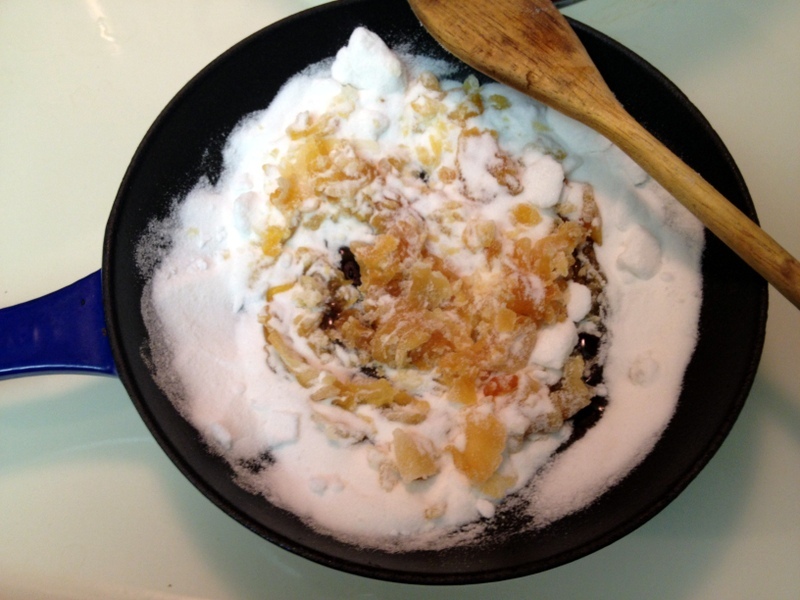 In small frying pan, heat up sugar until it is all melted and amber in color. 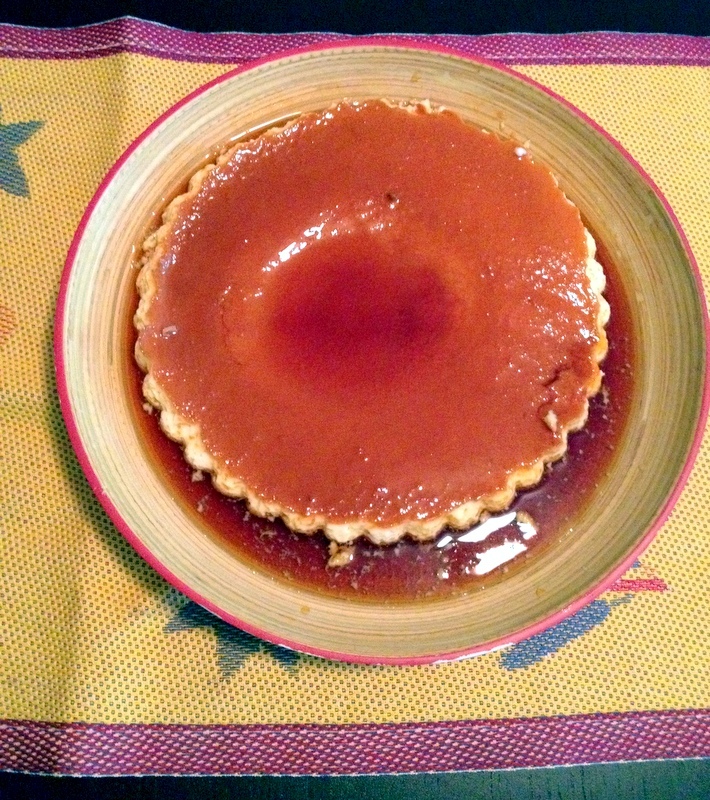 Pour into 9 inch round or tube baking dish, ensuring that the bottom is completely coated with the caramel. 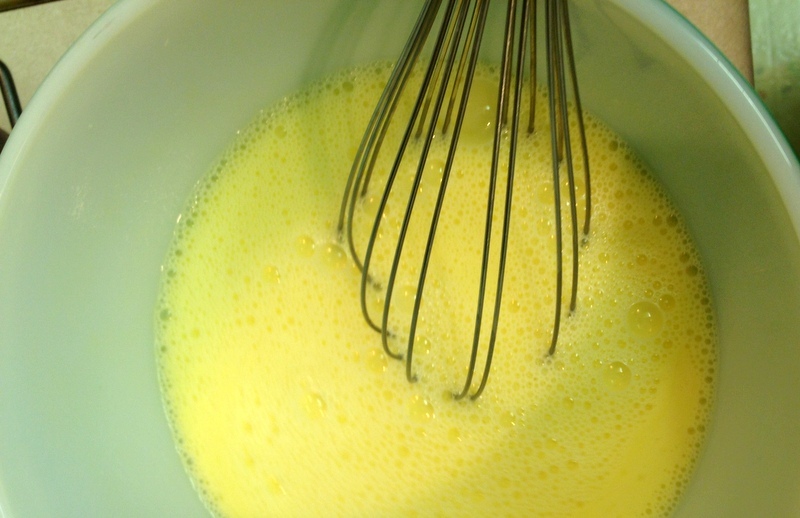 Top with the liquid custard. 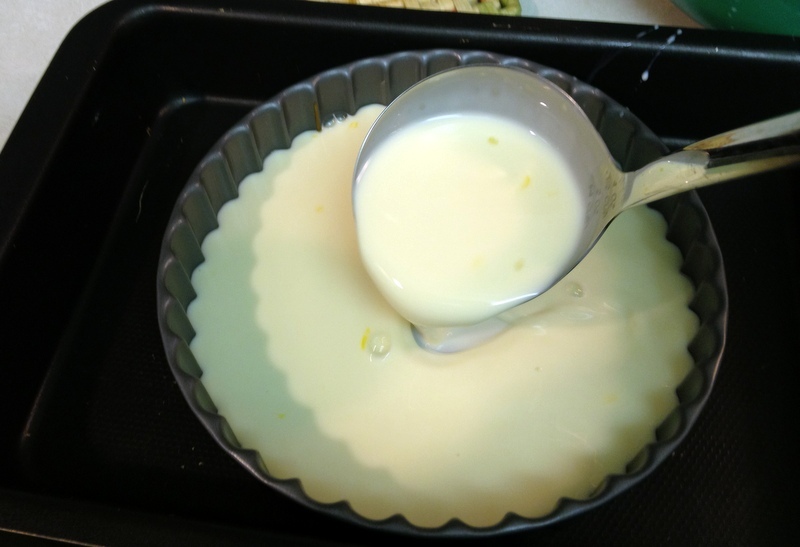 Place the baking dish into large pan and add an inch of hot water to make a water bath, being careful not to let the water splash into the custard. Slide it carefully onto the middle rack of the oven and let it bake for one hour. When done, remove it from the oven and the water bath and let it cool for about 30 minutes. 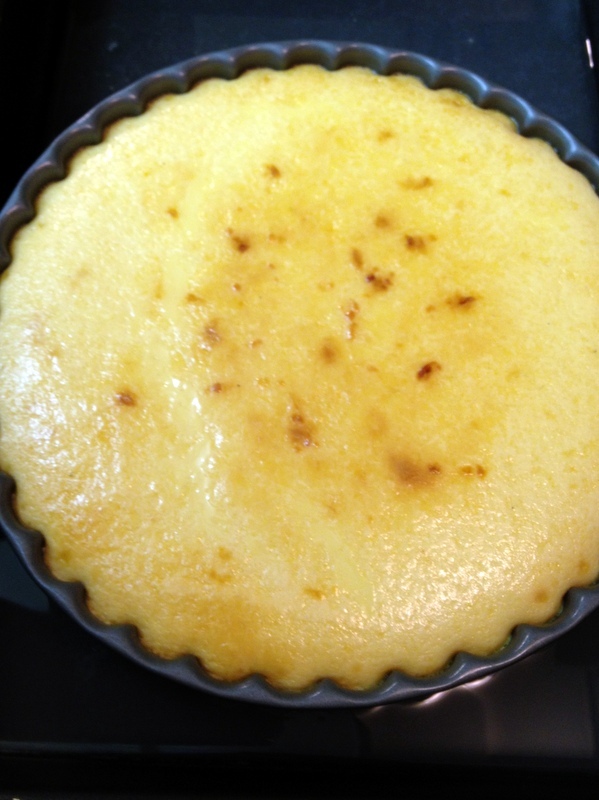 Run a knife carefully around the edge of the pan to loosen the custard before turning it out onto a deep serving plate. Chill before serving. Spoon a bit of the sauce over each piece. Why am I posting this in a food blog? Because in our family, food is love. 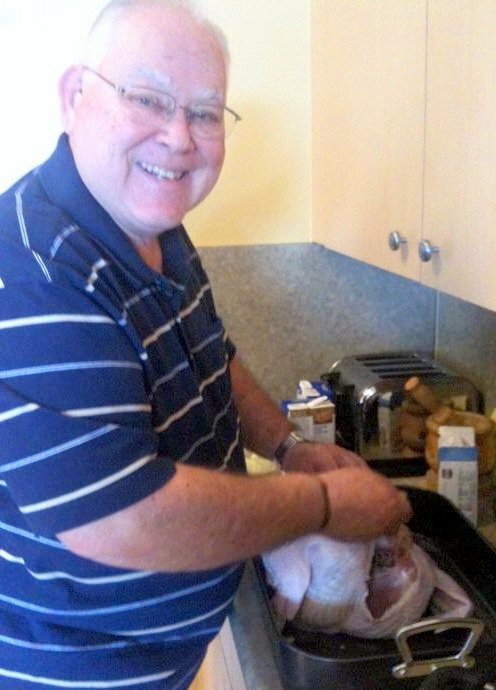 And also, the last day I saw my Dad alive, we cooked together. 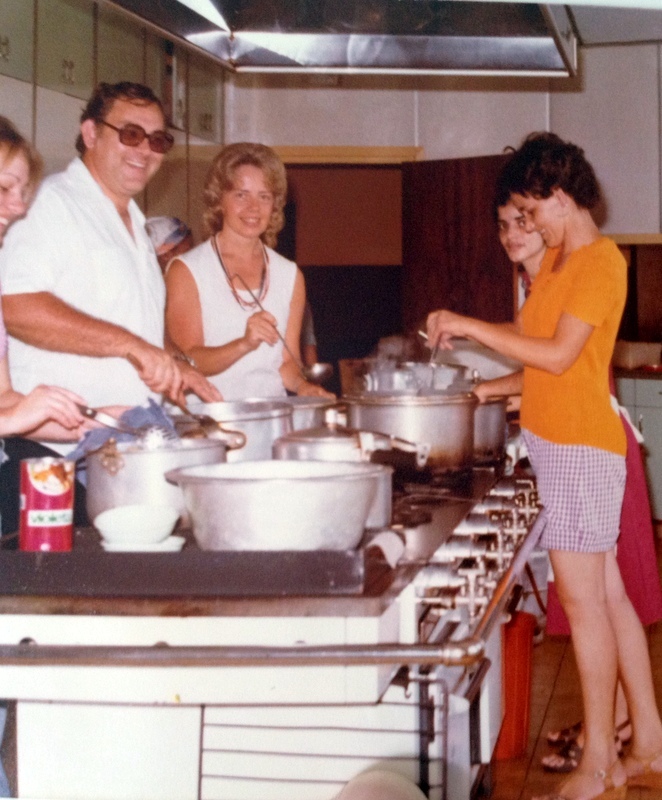 Dad was an amazing cook and there was nothing he enjoyed more than to cook for people that he loved. 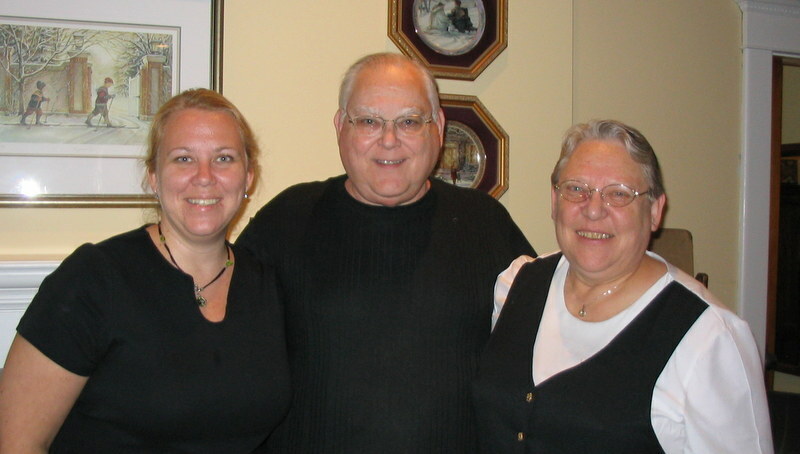 He, my brother Brian and I would spend hours together in the kitchen, trying new dishes and perfecting old favorites. 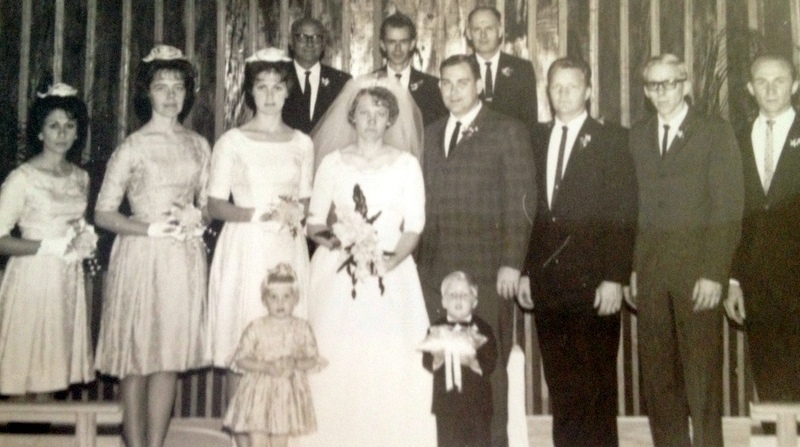 Some of my best memories of my Dad involve cooking great feasts for a house full of beloved friends and then sitting around the table, eating the delicious food and laughing until my sides hurt at Dad’s hilarious stories. stories about his misadventures on various shopping trips to the big city, stories about all these funny things that seemed to always happen to him. He had the best sense of humor. 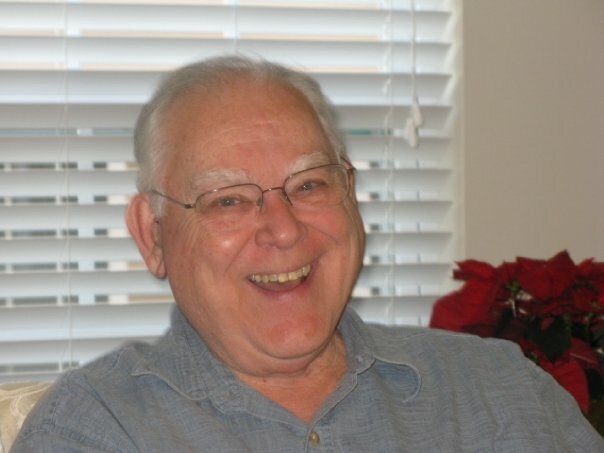 He told jokes that made everyone laugh and never poked fun at people in a hurtful way. He could laugh at himself most of all. He was someone that everyone liked to be around, because he always made you feel good about yourself…while feeding you something delicious. 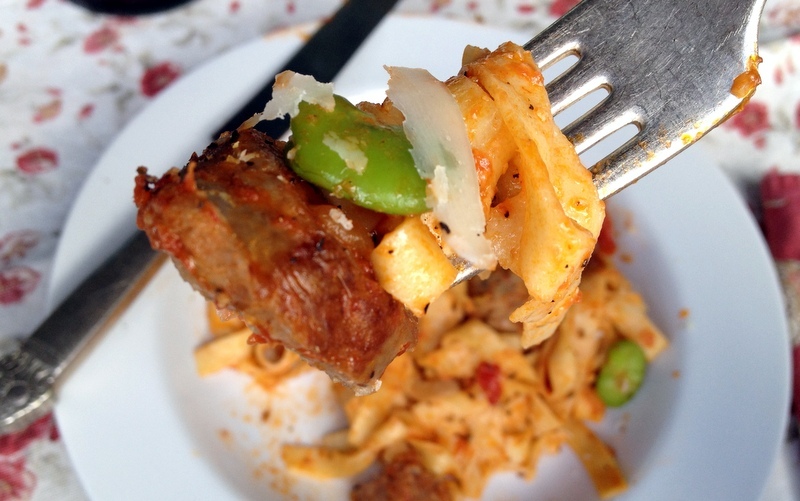 Many of the dishes on this blog have been things that we cooked together. Every post that I write, I mentally run past him. 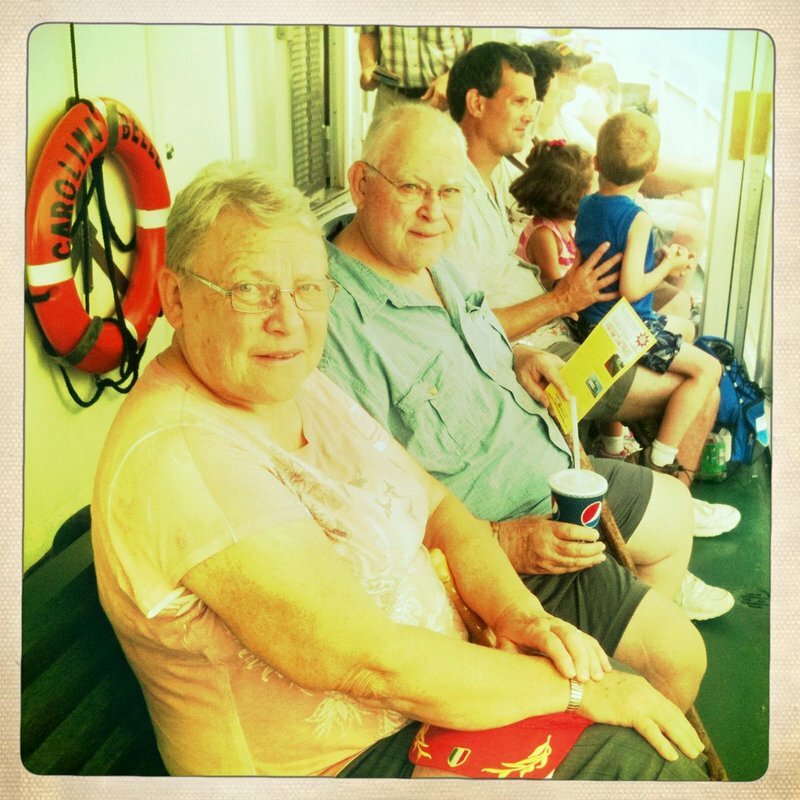 And quite possibly the nicest thing anyone has ever said about this blog was when my Mom told me that Dad would have loved it and would have been so proud of me. I had a very difficult time right around the holidays. 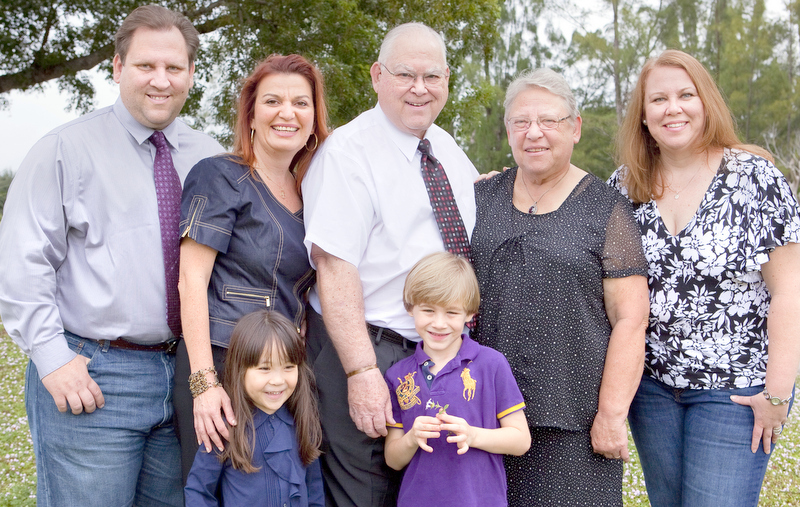 We always cooked big family feasts at the holidays as well as our special dishes that we cooked on just regular days. We were able to start working on this site right before Christmas and it has helped motivate me to express myself with my cooking that I love so much. 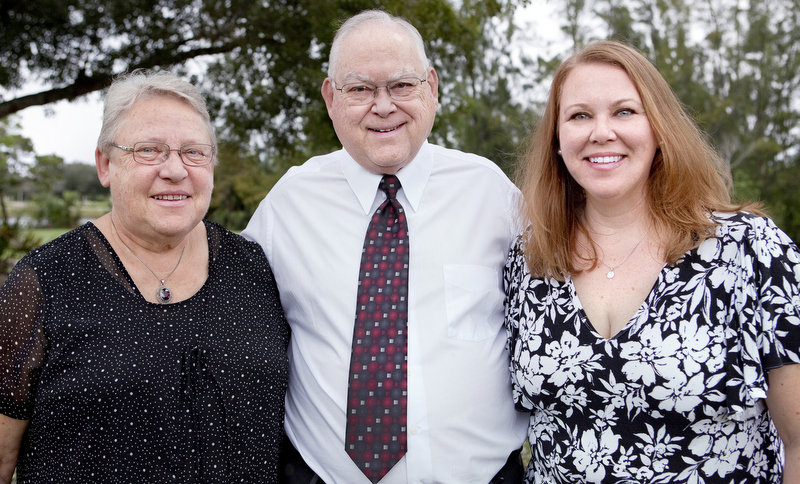 It’s been a living memorial to my Dad who inspires me each and every day. Thank you, Alice for giving me this forum with which to share the love. B’s pasta recipe had my mouth watering. 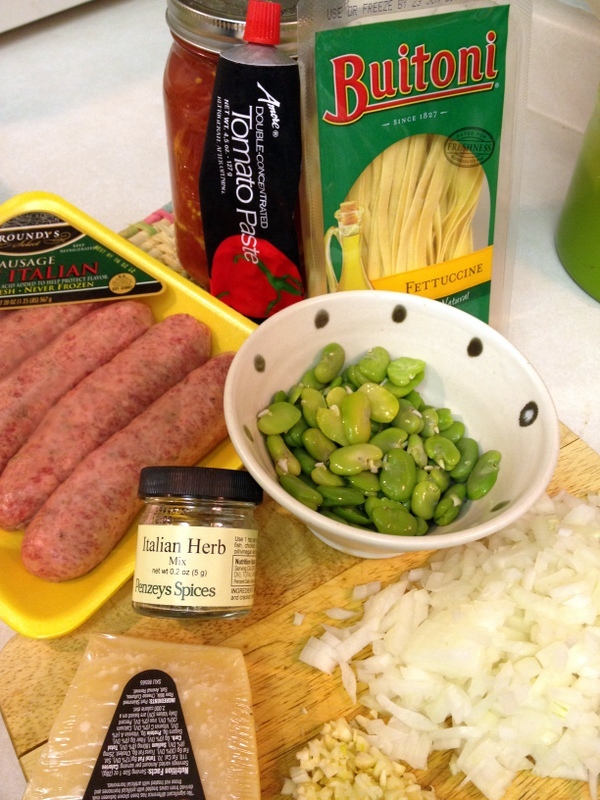 I love how adding sausage pieces to a pasta sauce is like adding meatballs, and I don’t know why broad beans (fava beans) are not in pasta more often. It seems a logical combination. If the pasta is a first course, then how about a bit of rabbit to follow? 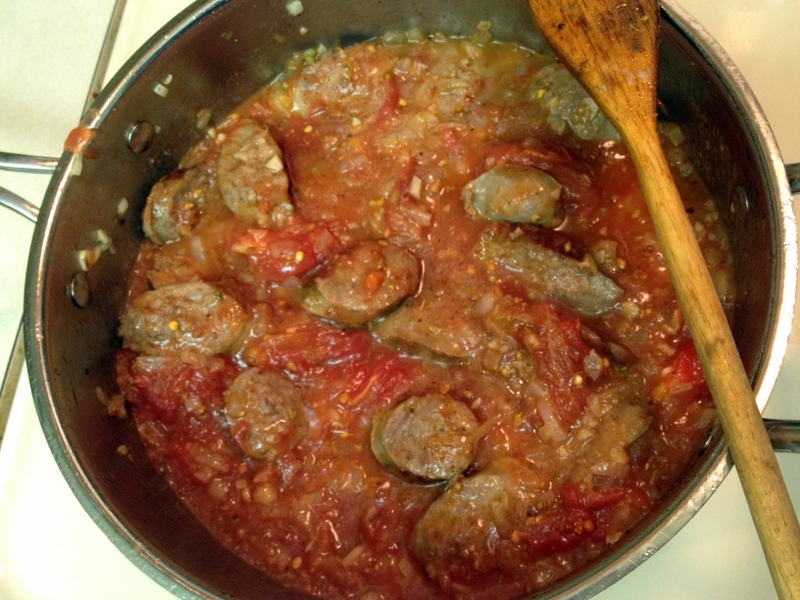 This recipe is from Marcella Hazan’s book Essentials of Classic Italian Cooking, which is a staple cook book for my husband and I. We made this rabbit dish a few years ago for friends, back when we didn’t even have a dining table in our tiny apartment. It was a memorable meal. Especially when the cat was slipped a taste by one of the guests and he went absolutely wild. 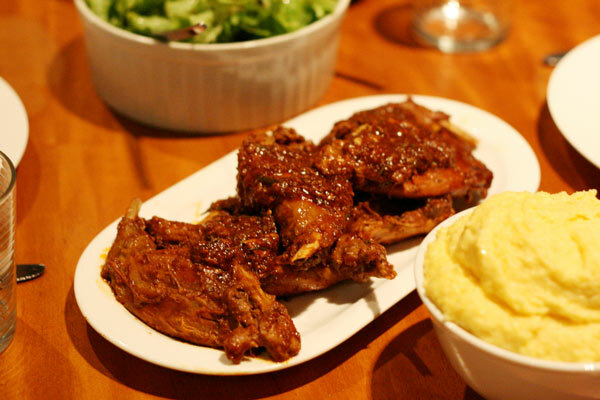 When I saw some meaty looking rabbit legs at the market, and Jason was back for a visit from out home in Trinidad, so it was time to make it again. 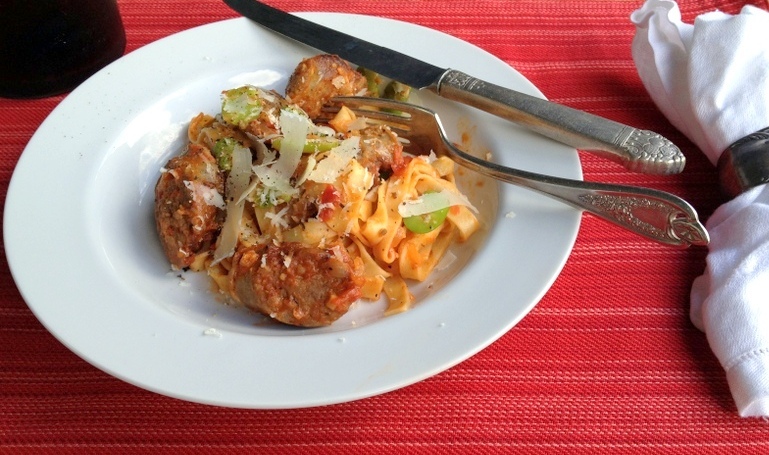 It is actually a simple dish, but the final flavours are anything but. The recipe calls for a full rabbit in pieces, but you could use all legs instead like I did. 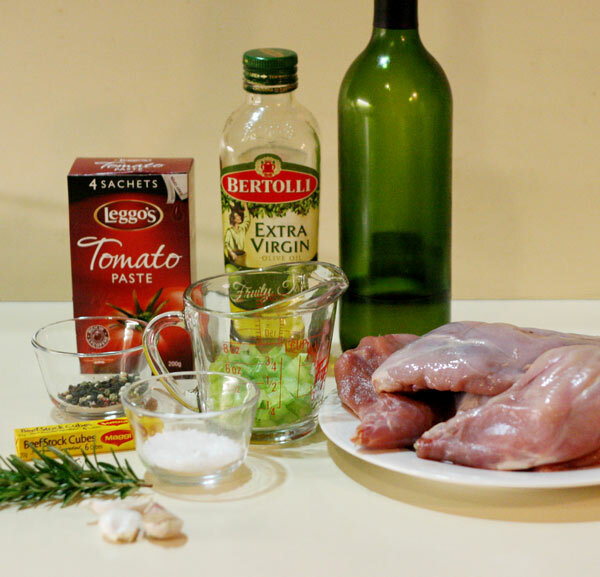 Rabbit, white wine, olive oil, celery, tomato paste, garlic, rosemary, beef bouillon, salt and pepper. I bought farmed rabbit so I skipped the overnight soaking of the rabbit. I understand that is needed if you have a wild rabbit. 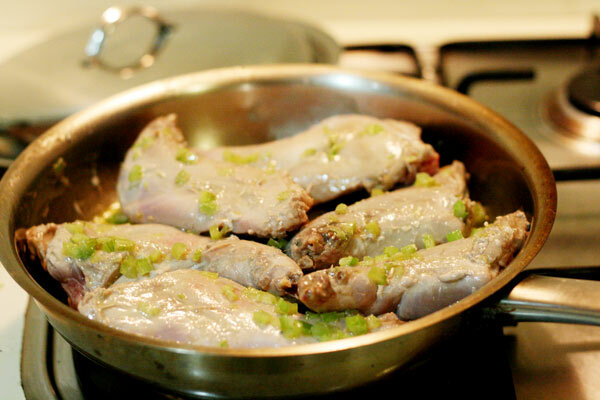 I started by adding the oil, garlic and diced celery to a pan, along with the rabbit. I chose a pan that would fit all of the pieces without overlapping. 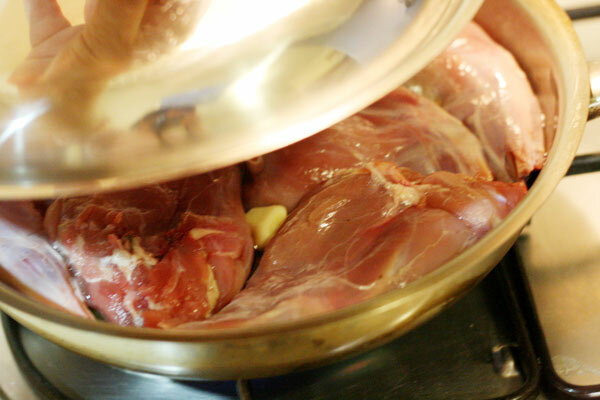 Over low heat, and with the lid on, I set this to cook for a couple of hours, turning the rabbit pieces occasionally. I think you could continue to cook until the meat is falling off the bone, so allow some more time if you can. With the lid off I then cooked down the liquid that was in the pan from cooking the rabbit pieces. When that liquid had reduced, in to the pan went the rosemary, wine, salt and pepper and turned the heat up to the point where the wine simmered. I mixed the bouillon cube with some tomato paste and water. When most of the wine had evaporated, I added the bouillon mixture. I kept the pan at a simmer, turning the pieces from time to time, until a thick sauce formed. I served straight away on a platter, alongside some polenta with parmesan, a green salad and a good friend or two. Buon appetito B. Do you mind if I picture you on a Vespa zipping around to get the ingredients for your next post? You will find that at the end of two hours, the rabbit has shed a considerable amount of liquid. 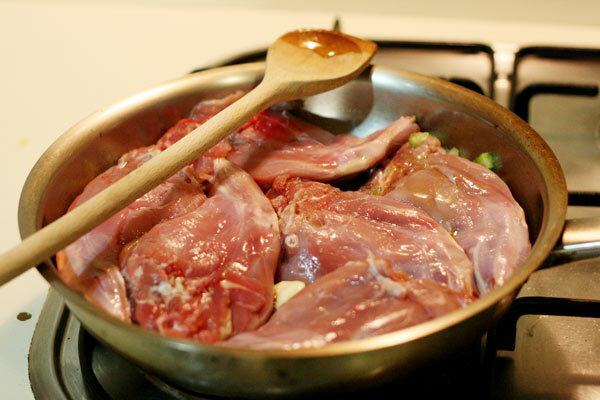 Uncover the pan, turn the heat up to medium, and cook until all the liquid has simmered away, turning the rabbit from time to time. Add the wine, rosemary, salt and pepper. Allow the wine to simmer briskly until it has evaporated, then pour the dissolved bouillon cube and tomato paste mixture over the meat. 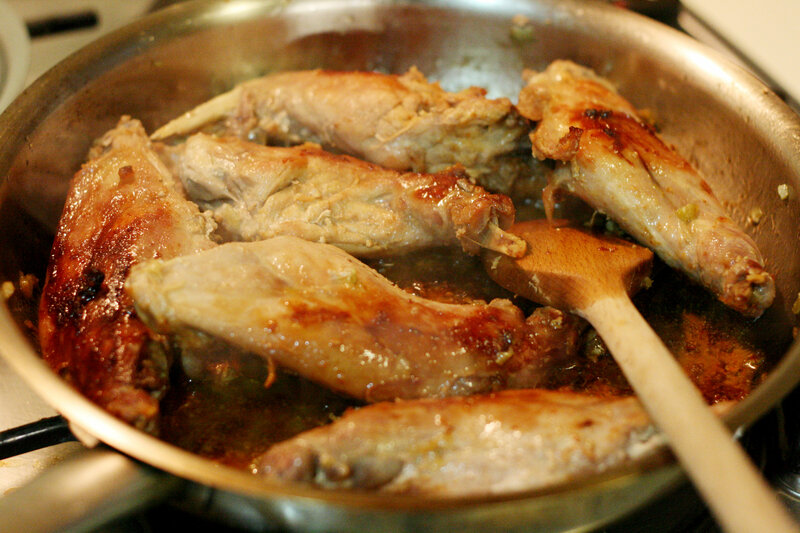 Cook at a steady, gentle simmer for another 15 minutes or more, until the juices in the pan have formed a dense little sauce, turning the rabbit pieces over from time to time. 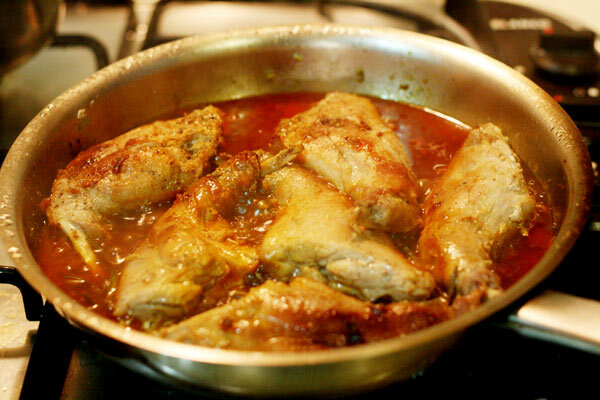 Transfer the entire contents of the pan to a warm platter and serve promptly. I love the detour into Italy, Alice! 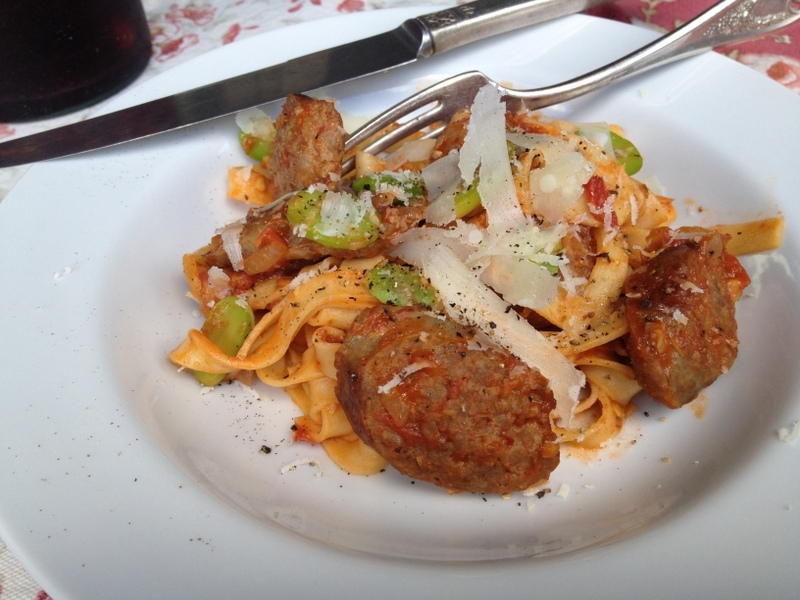 I’ve always wanted to visit Italy, so I will do so virtually with this pasta dish. 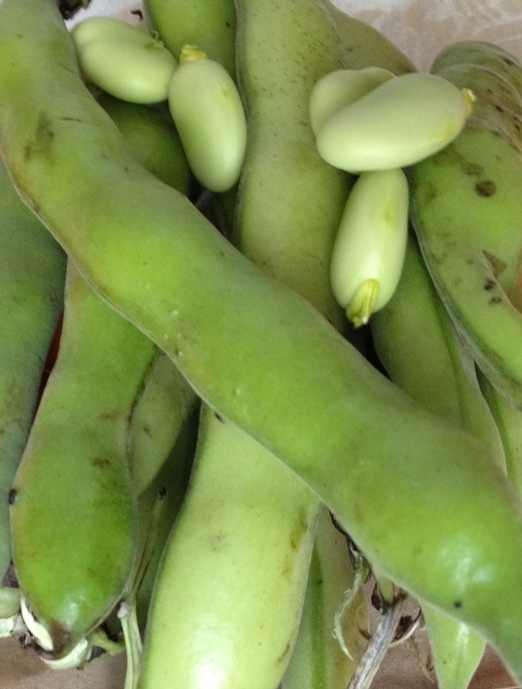 I found these fava beans at the farmers market. 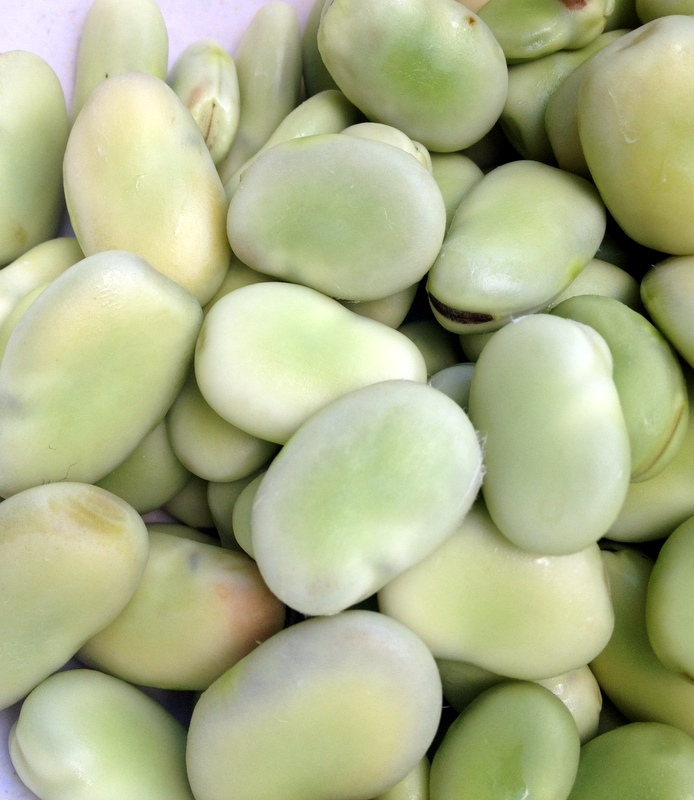 They are also known as broad beans. 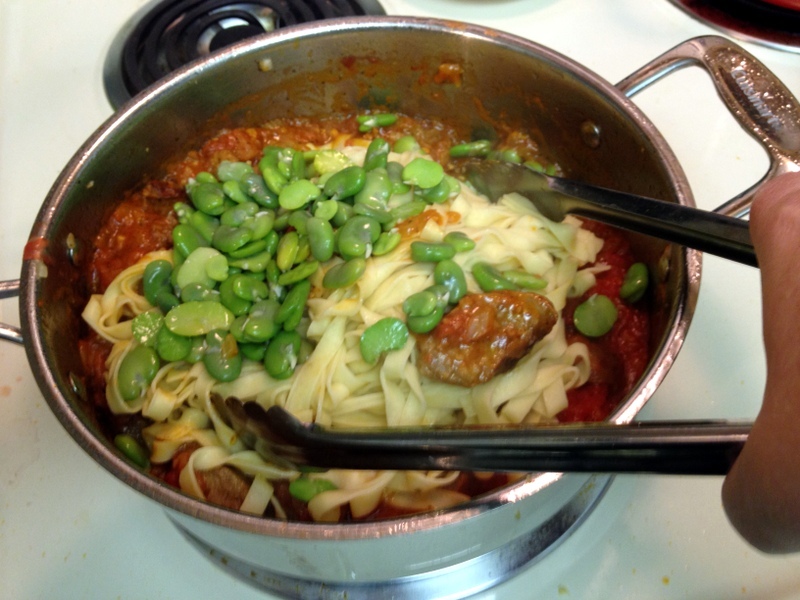 I have never cooked with fava beans before, but I’ve always liked them in restaurant dishes and then I saw the most wonderful looking pasta recipe on a local Minnesota food blog RelishingIt.com. So this was just my excuse to finally try cooking with them. So first, the fava beans need to be shelled. They grow in pods, like most beans and peas. 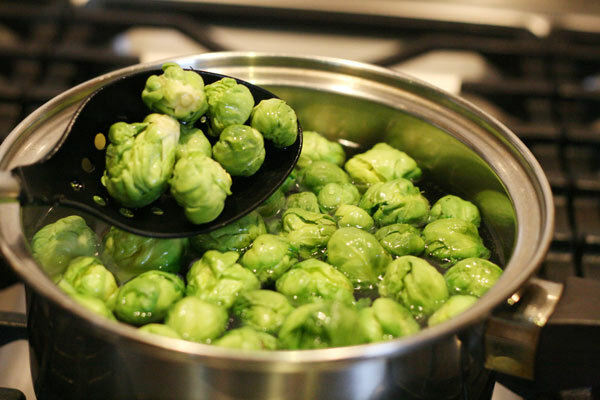 Then they need to be blanched – which just means that they should be dropped into a pot of boiling water for about three minutes, scooped out and then dropped into ice water. 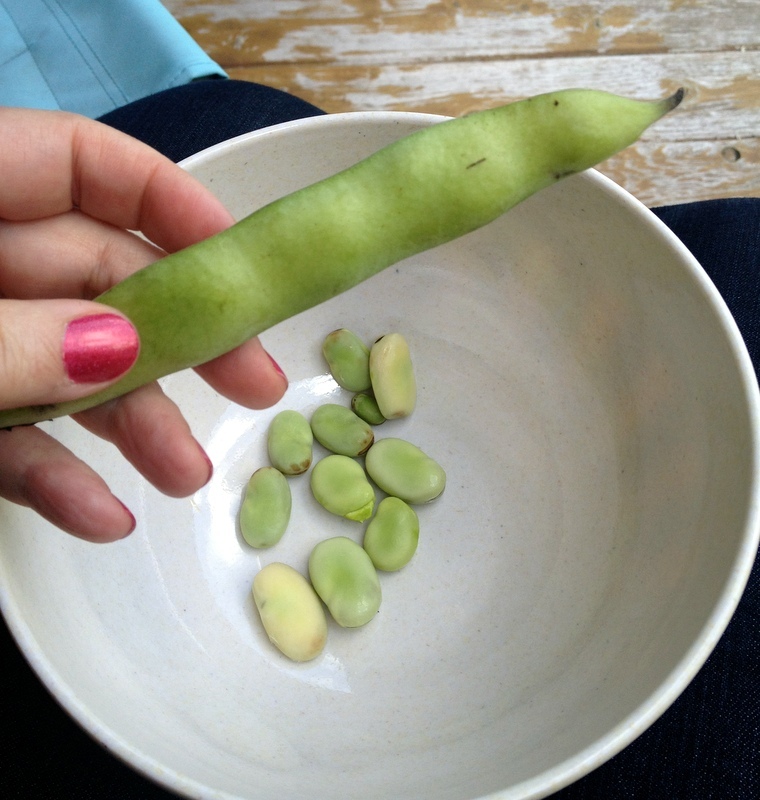 The pale green outer skin peels right off, revealing a bright green bean. Set them aside and begin the pasta sauce. And let it all cook down. 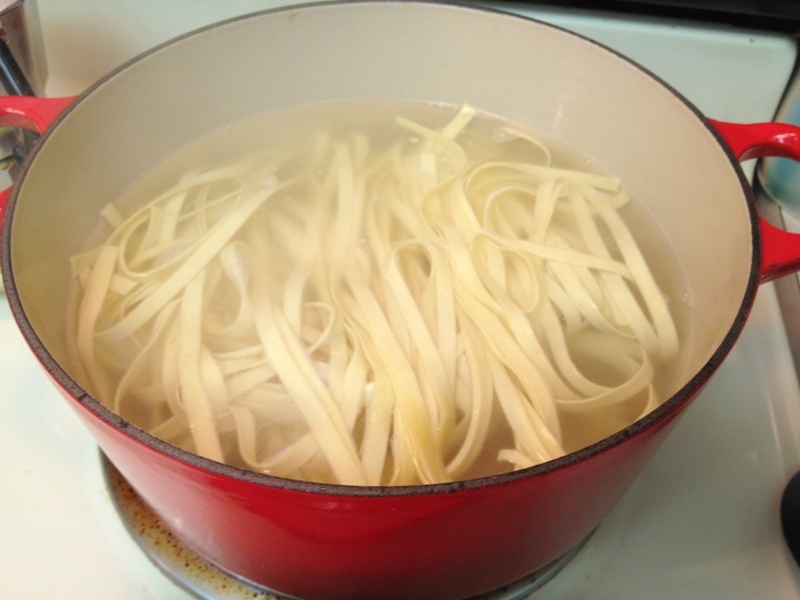 As the sauce was cooking, I brought a large pan of water to a boil, added some fresh fettuccini and let it boil for a few minutes. Check the package for specific cooking times, keeping in mind that fresh pasta cooks more quickly than dried pasta. Tossed and topped with some fresh grated parmesan. I got the large shreds of cheese by using a vegetable peeler on the chunk of parmesan. Using a nice Parmigiano-Reggiano will add so much flavor to your dish, so don’t skimp on the quality of the cheese. Alice, I like the way your mind thinks and can’t wait to see where we’re going next. Bring a pan of water to a boil. 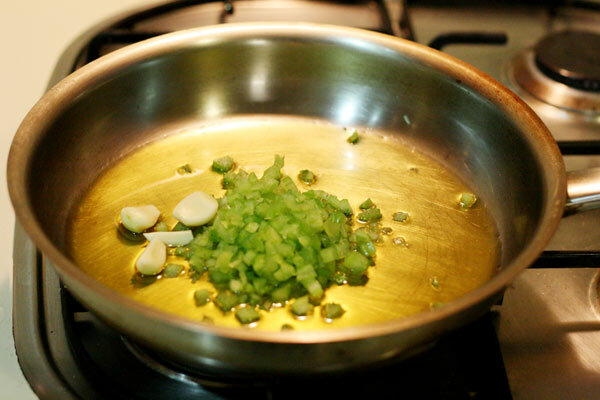 Once it is boiling, add the shelled fava beans. Boil for two to three minutes. Remove the beans from the heat, drain and place them into a bowl of ice water. Let cool in the water for a couple of minutes. 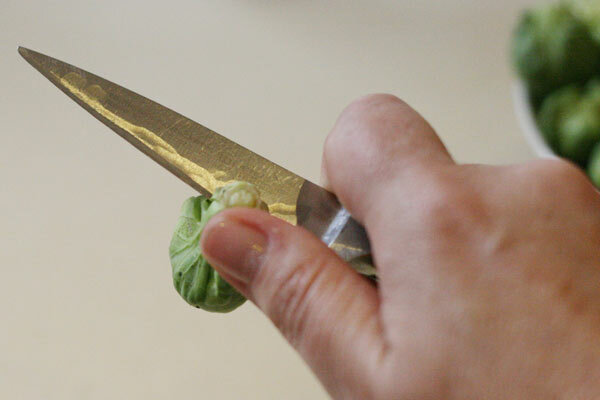 Then, remove the light green peel from the beans using your hands. 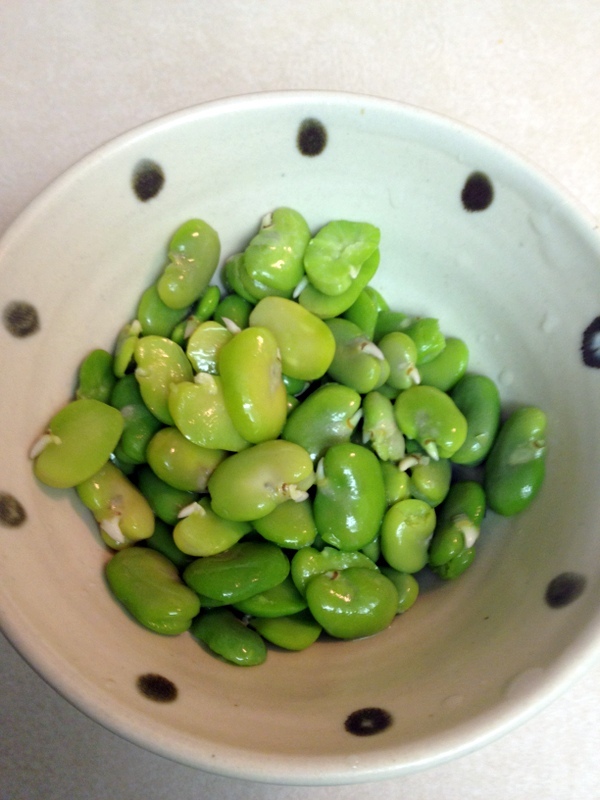 The fava beans will be bright green in color. Set aside. Bring a large pot of water to a boil for the pasta. Meanwhile, begin making the sauce. 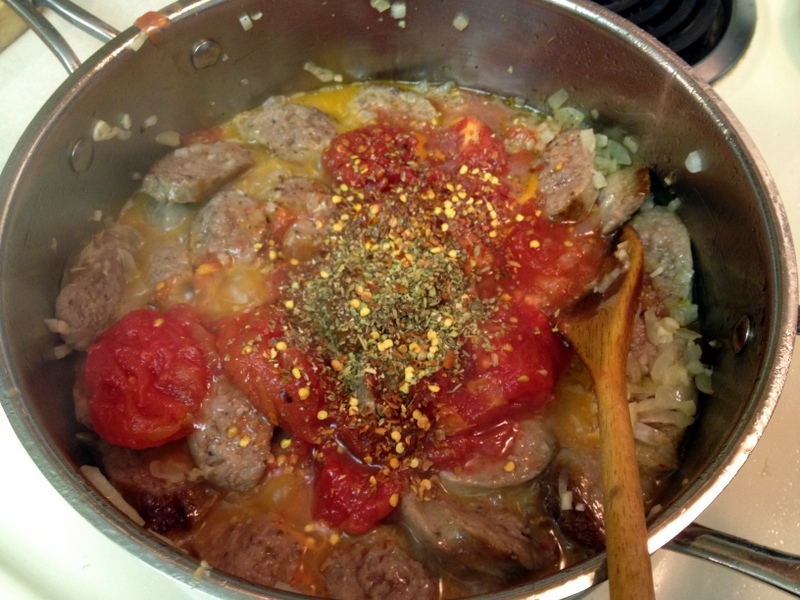 Heat a large skillet and add the Italian sausage links to it. When they are browned, remove and set aside. 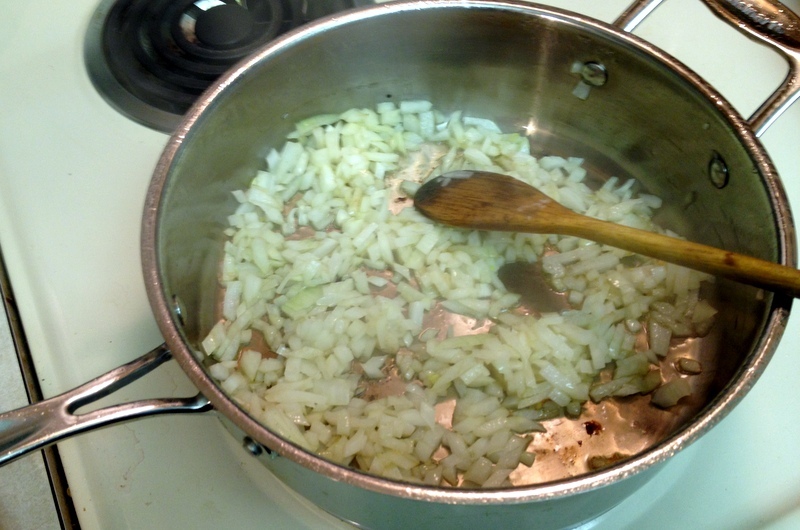 Add the onion and garlic to the pan with a splash of oil and continue to cook for a few minutes over medium-high heat until the onions start to become somewhat tender. 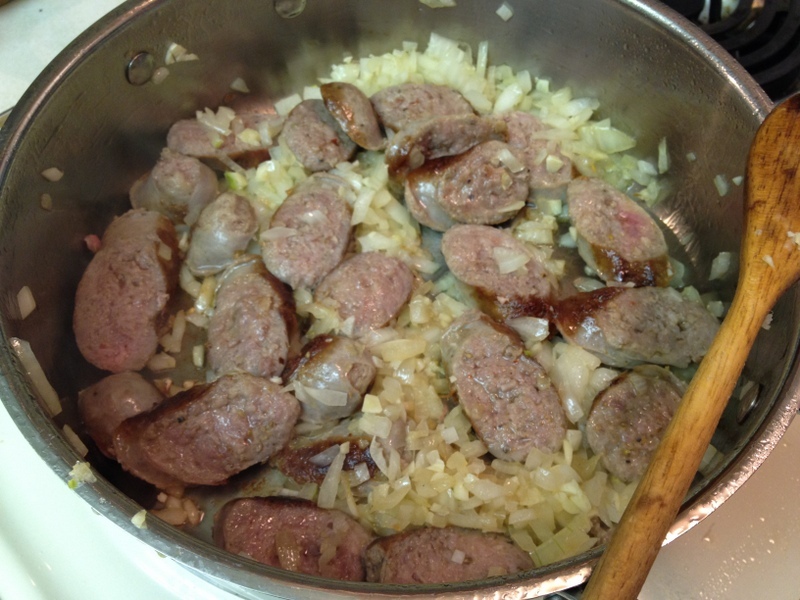 Slice the sausage links and return the slices to the pan with the onions. Add the tomatoes, tomato paste and spices. Cook for a few minutes until the flavors have combined a bit and the sauce has thickened. Add the fava beans and cook a few more minutes. Taste the sauce and adjust the seasonings. I can imagine sitting at a bar being very happy with a plate of B’s roasted potatoes in front of me. My choice of dish was influenced by a dinner my step-mother cooked the other night. 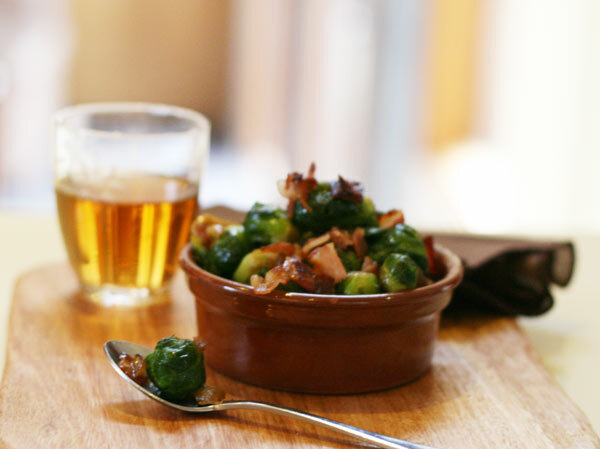 Betsy cooked this Brussels sprouts recipe from the book Italian Local by Tobie Puttock. They are more of a side dish than a tapas dish, but I have to say, I would be thrilled to eat them with a drink at a bar. We actually doubled the recipe and ate them as an entrée (appetizer in American speak), for four people. Light and flavoursome. One of the best things about this blog for me is being able to share food as I discover it, try recipes recommended by friends, try things I would never normally attempt, and also have a recipe file for myself for later use. This is one of those recipes. I plan to make this every Brussels season. 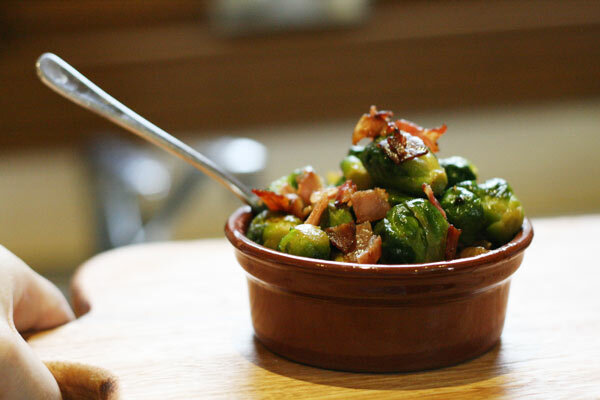 Baby Brussels sprouts, onion, garlic, pancetta, thyme, butter and salt and pepper. I also used a little olive oil. 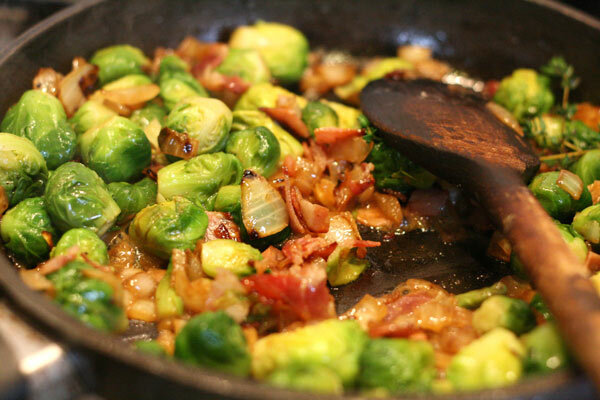 I began by chopping off the bases of my gorgeous little farmer’s market Brussels. They were so small and fresh they hardly needed any outer leaves discarded, but in general you will need to chop off the end of the stem and remove the outer leaves. I then put them in to a bowl of cold water to soak. I cut up the pancetta in to a dice, and put it in to a heavy bottomed fry pan over medium heat. 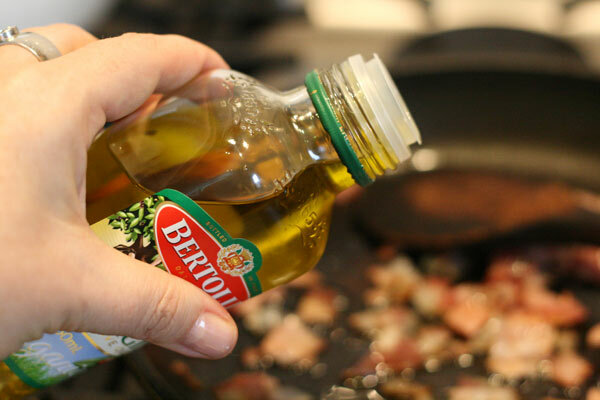 I added a little olive oil to the pan, as I wanted some flavoured oil to be left in the pan after cooking the pancetta, and there did not seem to be much coming from the meat itself. 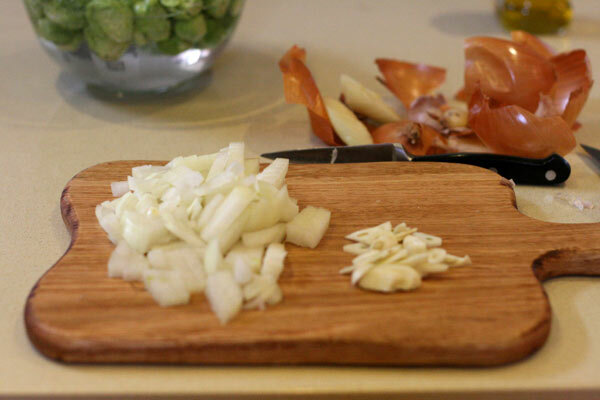 While the pancetta was cooking I chopped up the onion to a dice, and the garlic in to slices. 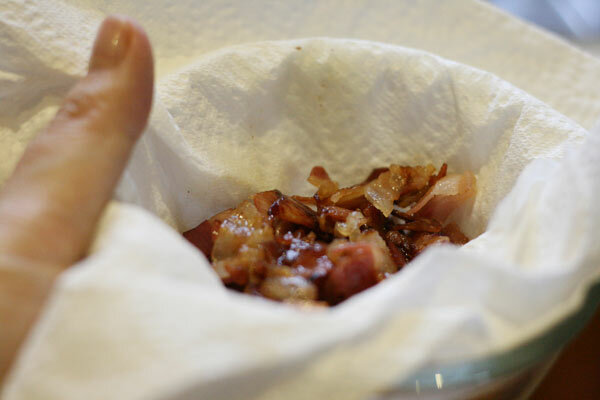 When the pancetta was crispy, I scooped it out of the pan on to paper towel, leaving about a tablespoon of fat in the pan. 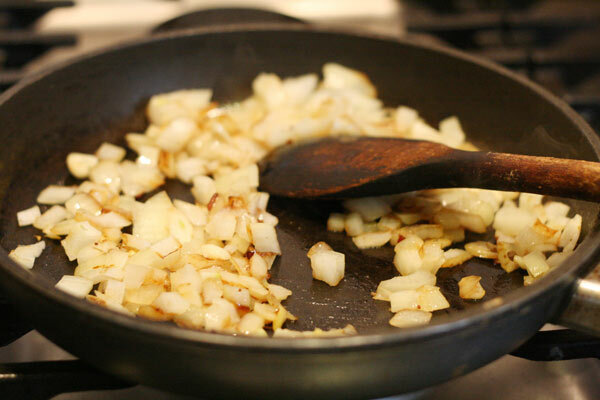 I then cooked the onion in the pan with the remaining fat. 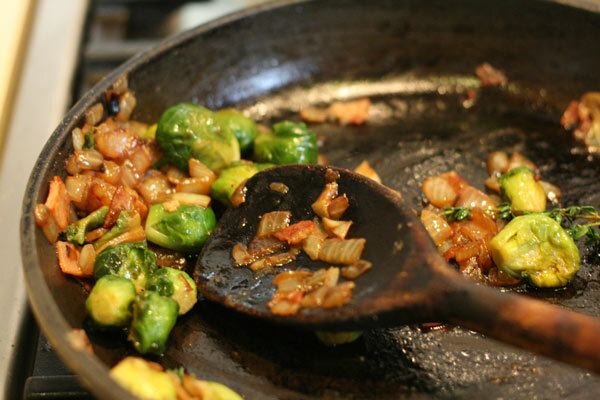 I sautéed until golden, they picked up colour as they deglazed the pan. I added in the garlic at the same time as the onion, but in future I would add it later on, I think it was overcooked. When the onion and garlic mix was cooked, I put it in a bowl. 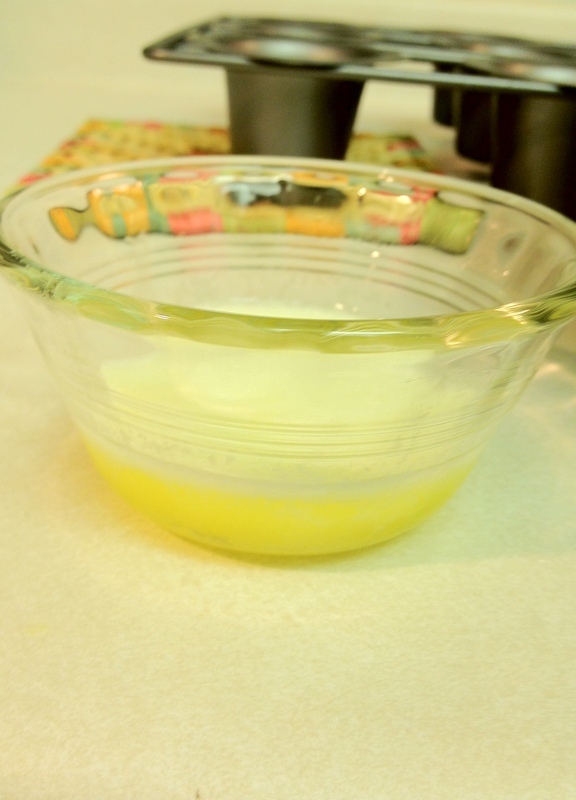 I kept the pan on the stove for a future step, and put in the butter to let it melt slowly off the heat in the pan. 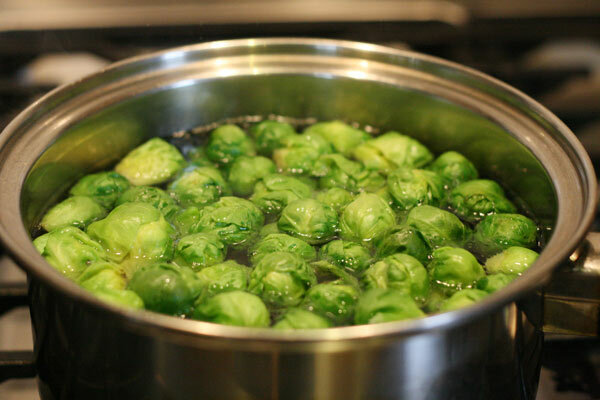 I brought a pot of water to the boil, and scooped the Brussels out of the cold water and into the boiling water. I cooked them for four or so minutes. I wanted them to still be a little firm. From the boiling water they went straight in to the fry pan with melted butter, where they cooked for a few minutes over medium heat, then I added the onion mix and thyme, and cooked for another minute over low heat. Then half the pancetta went in, and I mixed it through. I seasoned with pepper and salt to taste. 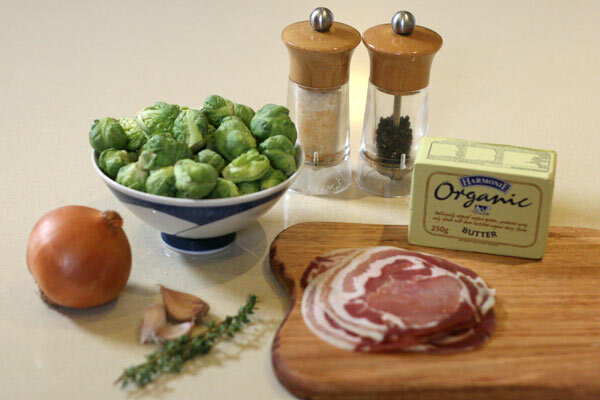 When I served them up I used the remaining crispy pancetta as a garnish. I have to admit, I was concerned I would eat it before I would get to take the pictures it was that good! It is best served straight away. B, I have taken a side step, although I still believe this would fit well in to our Spanish night out, this is an Italian dish… where to from here? 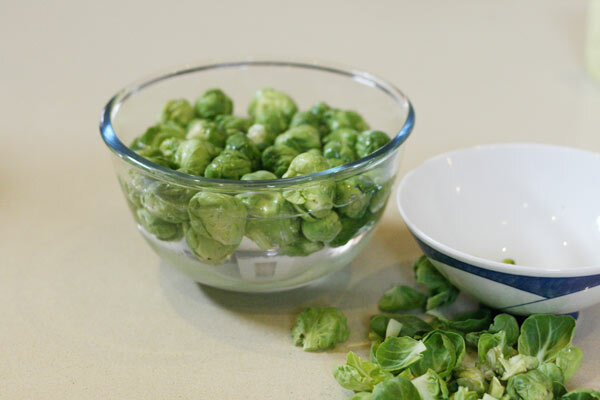 Place Brussels sprouts in cold water to soak. 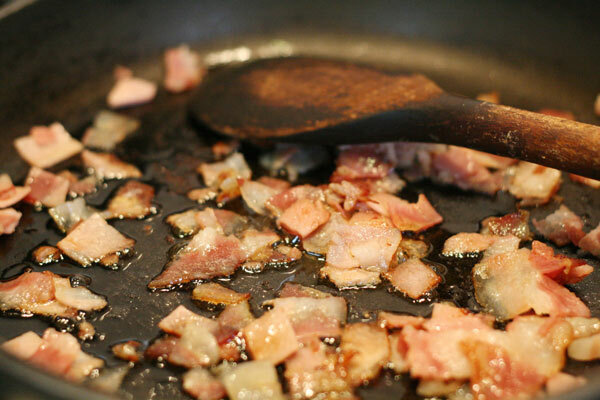 In a fry pan over medium heat, cook the pancetta until crispy, add a teaspoon or so of olive oil if there is little fat coming out of the meat. 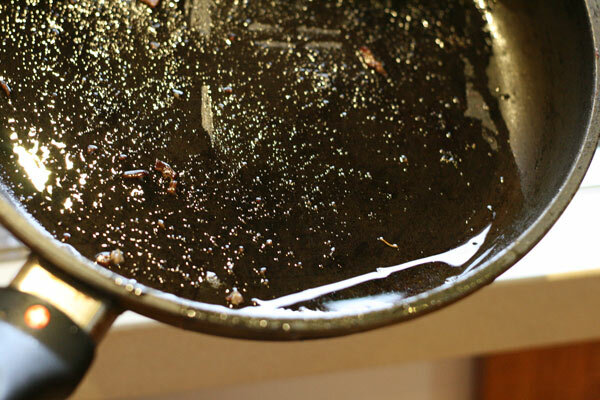 When cooked scoop from the pan, leaving the flavoured oil and fat, and set aside on paper towel. 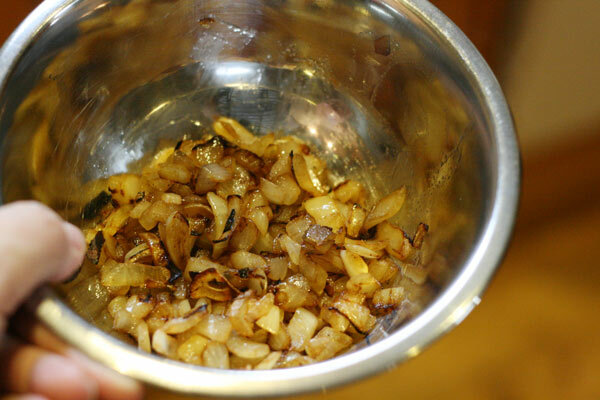 In the fat in the pan, cook the onions, for around 6 minutes, and then add in the garlic and continue to cook for another few minutes, until the onion is golden. Transfer to a bowl and set aside. Add the butter to the pan off the heat, to melt slowly in the residual heat. 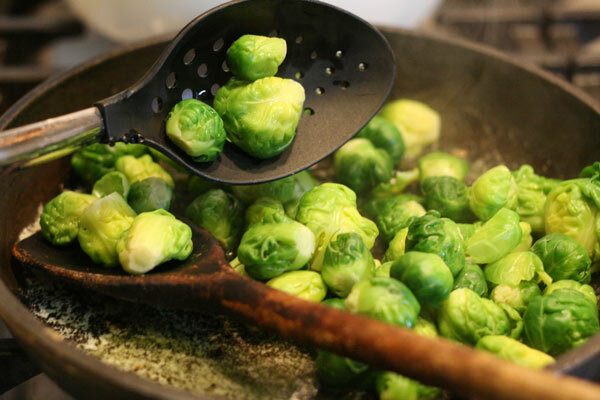 Bring a pot of water to boil, and using a slotted spoon scoop the soaking Brussels and put them in the boiling water. Cook for 4 minutes or until tender, but still crisp. 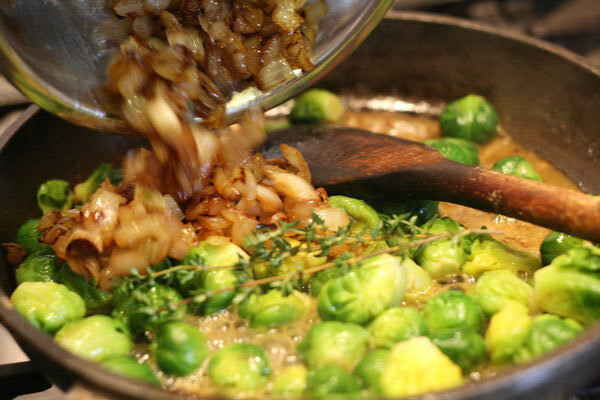 Transfer the Brussels to the pan with butter using a slotted spoon again, and sauté over medium heat for 3 minutes. Turn the heat down to low and add in the onion mixture, and the thyme, then sauté for one more minute before mixing through half of the pancetta. 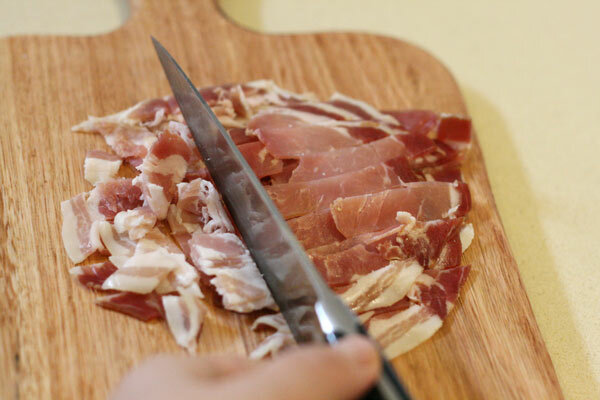 Serve immediately using the remaining pancetta as garnish.